Cronulla Sharks 18 (Jamie Chapman 2, Kelly Gilmour, Alexandra Weir tries; Jamie Chapman goal) def. Penrith Panthers 12 (Emelia Kaafi, Lavinia Taiseni, Jessika Lealaiauloto tries) at HE Laybutt Sporting Complex. St George Dragons 32 (Taina Naividi 2, Ema Rainima, Rebecca Mose, Ana Tohi-Hiku, Sereana Naitokatoka tries; Sereana Naitokatoka 4 goals) def. Illawarra Steelers 30 (Teagan Barry 2, Keele Browne 2, Maddison Weatherall tries; Olivia Vale 5 goals) at WIN Stadium. Wests Tigers 30 (Litiana Smith-Warwick 2, Bianca Cornwell, Ally Beaufils, Emily Curtain, Mamana Alatani tries; Emily Curtain 3 goals) def. Newcastle Knights 16 (Carissa Harrison, Olivia Kernick, Joeli Morris tries) at HE Laybutt Sporting Complex. Parramatta Eels 48 (Tahlia Alexander 2, Allison Futialo 2, Chelsea-Lina Koomson 2, Anne Pati 2, Breeze E’e tries; Shondell Akhabue 4, Allison Futialo 2 goals) def. 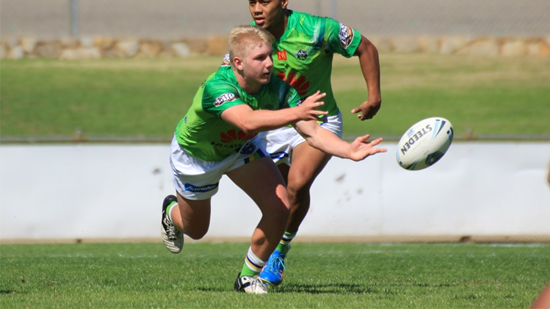 Canberra Raiders 4 (Taysha-Lee Campbell try) at HE Laybutt Sporting Complex.